Some of your worship sets might contain a song with just a vocalist and an acoustic. 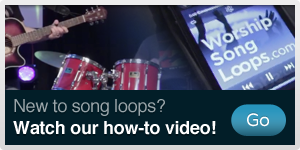 Why not add some interest by using a drum loop as well? Our loops are easy to incorporate using your laptop or mp3 player. In this video we'll show you an example featuring How Great Is Our God.